Complaining about being taken away from his own research, Dr. Rodney McKay accompanies Lt. Colonel John Sheppard to the gate room. Richard Woolsey signals the Daedalus that they are ready, and Dr. Daniel Jackson transports down to the city in a flash of light. Eager to hunt for a secret lab that he believes the Ancient scientist Janus hid in Atlantis thousands of years ago, Jackson shares oblique references from the journal of Janus’s assistant, which support the existence of a hidden lab that was used for unauthorized research. As the Daedalus offloads supplies, Woolsey prepares to board the ship. He will meet their Wraith ally, Todd, to negotiate how to test Keller’s gene therapy on live Wraith (“The Queen”). Per I.O.A. protocol, Sheppard stays behind as acting commander of Atlantis. Dr. Jennifer Keller will join Woolsey. Concerned for her safety, Ronon Dex decides to accompany her on the mission. They pass McKay and Jackson as the two scientists make their way to a dark, abandoned corridor near the city’s edge — tipped off by the reference in the journal of Janus’s assistant, who reported that one time he turned down a corridor and, when she looked back, he had vanished. Noting the waterline on the wall (from recent flooding), Jackson points out three empty recesses. McKay is impatient with the project he is sure will go nowhere, but at Jackson’s insistence he locates the missing sconces in storage. When reattached, each light fixture emits a different tone when touched. Understanding how their controlled harmonic resonance will destabilize the magnetic properties of the door, McKay stations Jackson at the end of the corridor, leaning heavily against the wall. When McKay taps the sconces, Jackson falls through the wall and inside Janus’s darkened lab. As the two explore deeper into the room, the lights come on. A small red light on a non-descript device starts to blink. On an icey-planet on the other side of the galaxy, a similar light on a similar device in a similar lab also starts to blink. Jackson and McKay have unknowingly activated a signal. Aboard the Daedalus, Woolsey composes a speech to mark the historic occasion. But not one for ceremony, Todd refuses to listen to the speech when he and two other Wraith arrive on Daedalus. He prefers to start work immediately. As Jackson and McKay work through the night, an unidentified ship emerges from hyperspace over the ocean and races rapidly toward the city. Sheppard orders the city’s shield raised. But the ship passes through easily, landing on a pier. A strike team of three warriors in highly advanced combat suits enter a building, and deploy a device which drops them straight through the many levels until they reach the ground floor — the corridor right outside Janus’s lab. By the time Sheppard, Teyla, and a team of marines reach the area, the aliens have captured Rodney and Daniel and seized the signal device. The aliens return to their ship and escape with the two scientists, but one of their compatriots left to defend their escape is disabled. Because his suit emits an EM field which disrupts scanners, Dr. Zelenka doesn’t know if the alien inside the suit is dead or alive. He tries to cut through the chest plate. Sheppard suggests cutting the neck. Making headway, Zelenka notes a flashing yellow light on the armor. Everyone evacuates just ahead of the explosion which destroys the suit and any hope of identifying the being inside. Held in a cell of powerful laser beams, Jackson rouses McKay. 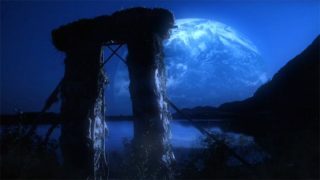 McKay theorizes that the stolen device must maintain a real-time link with a similar Ancient device elsewhere in the galaxy. Before they can escape, the ship reaches the ice planet. Deposited in a lab similar to Janus’s on Atlantis, they are commanded to make the machine operational. It’s an “end game” machine, designed to stop the Wraith at all costs. Set to affect all Wraith hyperdrives, it disrupts their specific frequencies, destabilizing their channel through hyperspace. Any Wraith vessel attempting enter hyperspace while the device is active would be instantaneously destroyed. Unable to travel except at sublight speed, it would end the Wraith threat by stranding them, starving them, or disintegrating them. But McKay also notes that Janus stopped his tests 10,000 years ago because of unforeseen problems. Having used Ancient technology to inadvertently blow up a solar system himself (“Trinity”), McKay is reluctant to activate the machine. Jackson attempts to reason with their alien captors, but they threaten to kill Jackson in one hour if the machine is not operational. Jackson tells McKay he doesn’t have to give in, but McKay resumes his work, and Daniel ponders why their captors remain hidden by body armor. In Atlantis, Zelenka isolates the subspace signal emitted by the device stolen from Janus’s lab. He traces it to M6H-987, a planet without a Stargate. Sheppard has him boost the Jumper’s subspace comm range so they can gate to the vicinity and contact the Daedalus. Having figured out how to active Janus’s technology, McKay throws the switch. He and Jackson wait for the unknown side effects … but nothing happens. On board the Daedalus, Todd works alongside Dr. Keller on preparations to disseminate the gene therapy. He tells her that he doesn’t know who or what the Wraith will be if they stop feeding on humans. He is summoned to the bridge, where he learns that another hive ship is attacking one of Todd’s facilities. He orders two of his cruisers to leave him on the Daedalus and join the battle. But as they jump into hyperspace, they are destroyed before his eyes. Todd knows what has happened: the Ancients’ Attero Device has been activated. Believing the team from Atlantis betrayed him, he pulls out a concealed device that renders the crew unconscious. Contacting his remaining hive, he has troops beam aboard while he locks down the ship. Ronon spots the Wraith soldiers coming on board and attempts to take Keller to the armory, but they are trapped. Soon enough, McKay discovers the unforeseen side effect of the Attero Device. But before he can shut down the machine, he and Jackson are stunned by the aliens. Meanwhile, back on Atlantis, Chuck dials the Stargate. He notes a power surge in the event horizon. Alarmed, Sheppard and Teyla return to the control room. Zelenka realizes that the gate is about to explode, and Sheppard orders the tower evacuated and the city shield collapsed around the gate to save them. The shield contains the blast, but it cannot contain the resulting energy long enough for it to dissipate. Zelenka works frantically to supply more power. But it is not enough, and a massive explosion blows out the windows. Atlantis’s Stargate has been destroyed, and Sheppard and Zelenka may not have survived. “Martin Gero has written a couple of great scripts and, in fact, will be directing a few days on them. Daniel Jackson appears in these episodes, and there are a lot of scenes between him and McKay. I suspect the way it’ll work out schedule-wise is that Martin will likely do the lion’s share of the work that involves just the two of them. It’s a lot of the cool stuff and I wish I was doing it, but the reality is we’re trying to condense the schedule. Martin can film those scenes while I’m shooting ones with the rest of the cast, so it makes sense from a scheduling standpoint to do it that way. “What else can I tell you about this story? Well, the spacesuits are a big deal and we find out in ‘The Lost Tribe’ who and what are inside them. The suit itself is a pretty neat concept and design. Among the things we did discuss earlier today are the scenes in this episode where Daniel and McKay have to put on these suits in order to go incognito and solve a particular puzzle. VOTE! How would you rate Atlantis's "First Contact?"